The Blues drew 2-2 with Brighton & Hove Albion in their first game just last week and this European encounter takes place at Merseyside Community Stadium in Southport, kick-off at 7 pm. The annual competition, which has been won by Porto in each of the last two campaigns, pits 12 of England's best Academy sides against 12 of the top development squads from across Europe. The 24 teams are then split into six groups of four, with the six group winners and best two runners-up advancing to the quarter-finals. Each team will face each other only once in the group phase, with all matches set to be played in England. The fourth side in Everton's Group D is Bayern Munich. On the night, two breakaway goals from the home side, scored before half-time, proved to be enough to secure the win for Everton. The goals came from Broadhead and Bowler to give Everton a commanding lead they did not give up. 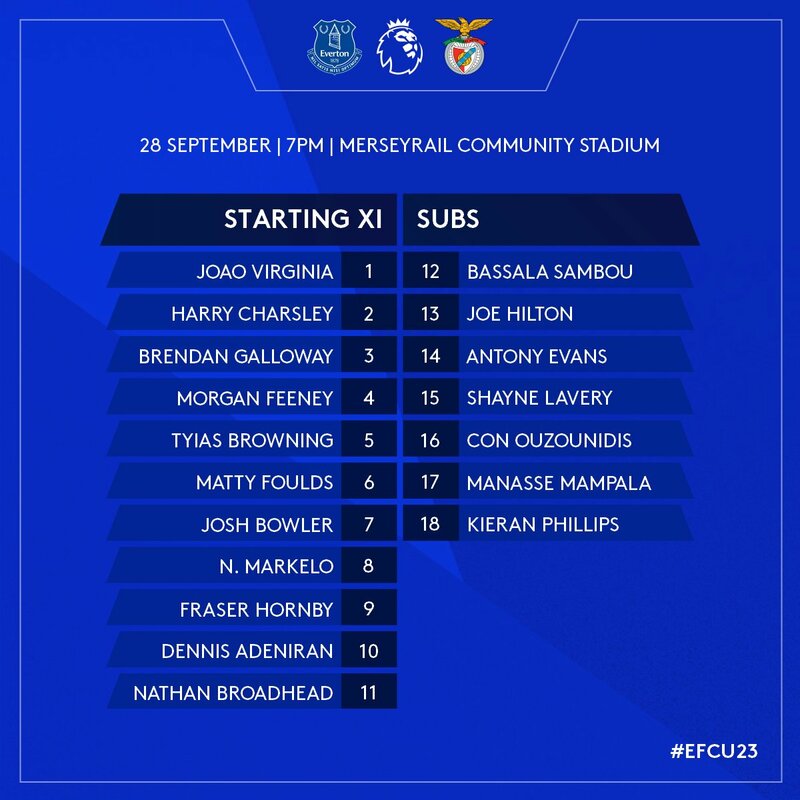 Everton U23s: Virginia, Charsley, Galloway, Feeney, Browning, Foulds, Bowler (90' Mampala), Markelo, Hornby (65' Evans), Adeniran, Broadhead (65' Sambou). Subs: Hilton, Lavery, Ouzounidis, Phillips. This is certainly a fixture that captures the imagination, what a shame these games aren't played at Goodison. Thanks for the reply, Michael, but may be it is the cynic in me that asks why we have changed the names in Management but not apparently the mode of operation. Perhaps Sunday may have been a better time after our super-duper mowers had flattened the Saturday bumps out of the pitch and both teams had experienced some hospitality at the Fulham game. It strikes me that these fixtures would be the perfect opportunity to create good relations with these clubs. Good luck lads. Bring us a Win. I live in Southport, Alan J (1), so suits me down to the ground. I don't think Sunday would've worked, Alan, because they are in the midst of a crazy fixture crunch. The U23s play West Ham on Monday — their 5th game in 11 days. After that, they don't play again for three weeks. Go figure! Expect some squad rotation again - which is a shame as this competition obviously has some prestige attached to it. We drew against Brighton in the first game and had a few of the U18s in the squad as it was only a couple of days after another fixture. This one is 3 days after the checkatrade fixture. Is this matched being screened? and Bowler, haven't got a clue how they are playing. Good result! 2-0 against the Benfica academy is a fine win. Two first half goals around the half hour mark by Broadhead and Bowler. Who was it that Silva poached as one of his coaches from the Benfica academy in the summer? Probably able to give Unsworth an inside line on their team. Great result and a welcome tonic for EFC. Heres to good result tomorrow and weekend for Evertonians. 29' GOAL! Everton. Josh Bowler. Everton double their lead! A terrific break forward sees Hornby look for Adeniran, he then picks out Bowler who coolly finishes past Duarto to make it 2-0. “Josh was outstanding tonight. He had one of those nights where he can do no wrong. He was outstanding. Benfica's academy is very, very good. Benfica is leading the league in Portugal (again!) and their 2nd team play in Portugal's 2nd division (they can never be promoted) and they are leading that also. For sure, some of the Benfica players who played tonight feature in their 2nd team. I see the club have suspended the head of the academy with regard to the inquiry into that Welsh kid. It seems that it all relates to the fact it was "cross border" as apparently this guy has been accused and exonerated of the same charge 9 times in the past. In fairness, given the political set up, and the fact Cardiff play in the English league, he may just have not stopped to think of the move as an "international" transfer in the way he would have for a German or Spanish kid. Ah Kieran, on a thread about the U23s beating Benfica 2-0 you can only contribute with an unrelated story about a suspended coach. Fair play, you are consistent. Jay (14), thanks Jay, I got that penalty off one of the reporting firms on Google, saw your description of the goal later. Sunday, we got him from QPR's last year, one to keep your eye on. Looks like a very good result. Interesting that towards the end Charsley and Galloway switched sides. Curious. Two lines of 5 and 4 worked closely together and looked to hit them on the break. A cold night in sunny Southport! Are you saying that Waldron, has been accused of this nine times Kieran? Interesting Kieran, maybe the cat that gets the cream has ran out of lives? But thats only if you think Everton, have got a very good academy of course! ( Gordon ) had a very good game. The U16's were also in action drawing 0-0. The U18's were playing Fulham at Fulham, hope this is a good omen, without keeping us as long waiting for the victory. Heard Virginia had a very good game. Wonder if he will prove inspired business. Could be our Number 1 in a few years if one of the sSky Darlings makes a move for England's No 1. Sam (24), looks a good strong keeper, nice and calm. He made his own way to England to play for Arsenal as a 16-year-old, then decided to join us last summer. He worked under our Portugese goalkeeping coach at Benfica. Turns out he is also being used as an interpreter for the Brazilian players in our squad. Speaks decent Spanish as well, so he is helping Mina to mix better, again as an interpreter... I don't know if he is making any headway learning Scouse.